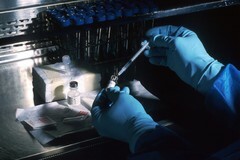 Hands of a scientist, under a sterile hood, preparing the carcinoembryonic antigen (CEA) vaccinia used to try to prevent cancer. The scientist is diluting the concentrated vaccinnia virus into a dose level appropriate for administration to a patient. This vaccinnia marks any cancer cells expressing the CEA.